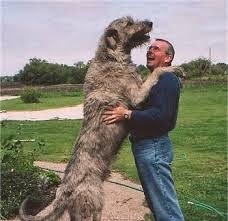 Irish Wolfhound is one of the tallest breeds in the world with a giant size. The legs are long and strong. This is a very old breed with Roman records dating as far back as 391 AD. 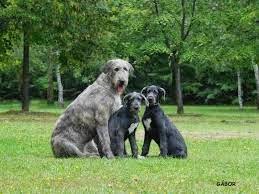 The native country is Ireland and other names are Wolfhound, Irish Hound, Irish Wolfdog, Cu, Cu Faoil. They were used in wars and for guarding herds and property. The Irish Wolfhound head is long, skull not too wide. Long, moderately pointed muzzle. Ears are small and eyes are dark. Body powerful, elongated , neck fairly long, very strong and muscular, well arched, without dewlap. Wide, very deep chest. Arched loin. Pronounced tuck-up. Fairly long back. Tail long, slightly curved, moderately thick and well-furnished with hair. 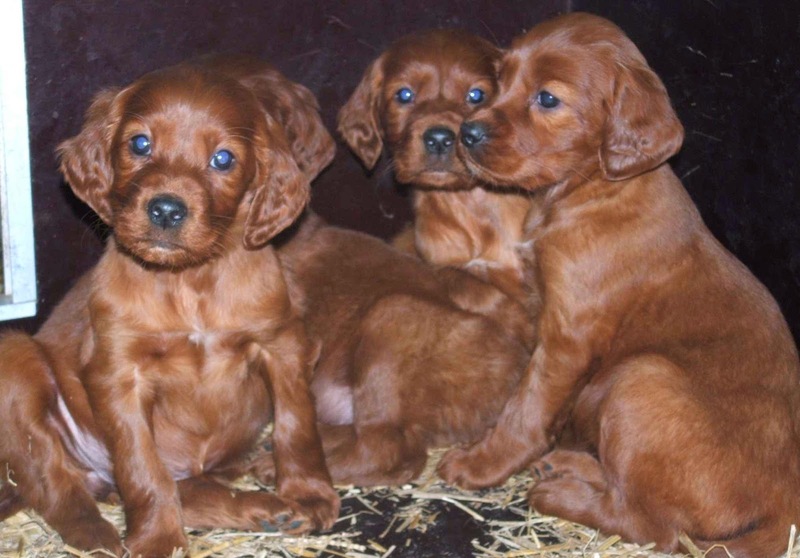 The wiry, shaggy coat is rough to the touch on the head, body and legs and longer over the eyes and under the jaw. 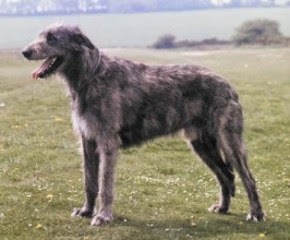 The Irish Wolfhound comes in various colours, from cream to black. Wheatens, reds of various sheds, and greys from pale silver to slate are included either with or without brinding. White on tip of tail and feet ( and legs) is acceptable. The body coat colour gray, brindle, red, black, pure white or fawn with gray being the most common. 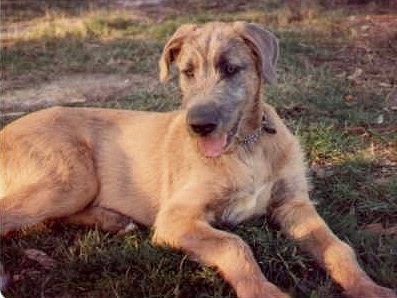 Irish Wolfhound is usually intelligent and sweet natured and friendly. 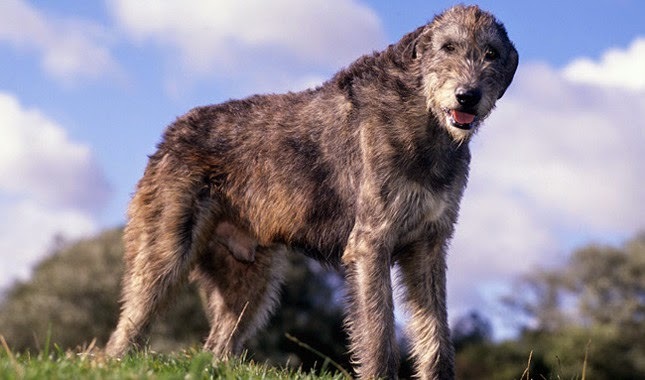 Irish Wolfhound weight about 40 to 69 kgs and height 71-90 cm, it reach up to 7 feet tall when standing on his hind legs. The life span ranges from 6-8 years. The Irish Wolfhound sheds a fair amount of hair. You will find hair stuck to your couch, carpets, clothes and every thing else in your home. 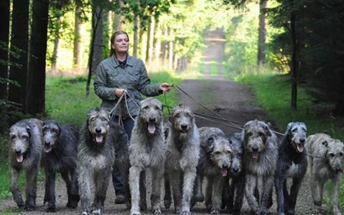 The Irish Wolfhound have the medium length coat and requires an occasional brushing.The Irish Wolfhound giant dogs need lots of space to run, but do not need any more excersie than smaller breeds. They need a daily walk. The Irish Wolfhound have 6 litters with a maximum of 13. On average female dogs come into heat twice a year or every six months. Health- dilated cardiomyopathy and bone cancer are the leading cause of death. Gastric torsion / bloat is common.